Inside, the Musqueam artist’s temporary workshop is cozy, scattered with her flowy Coast Salish pieces and carvings by her late father Irving Sparrow. Sparrow was chosen by the City of Vancouver to be the first Coast Salish artist to participate in a new cultural residency program. She has been working in the A-Frame Fieldhouse since July 2018. The residency will continue until July 2019. 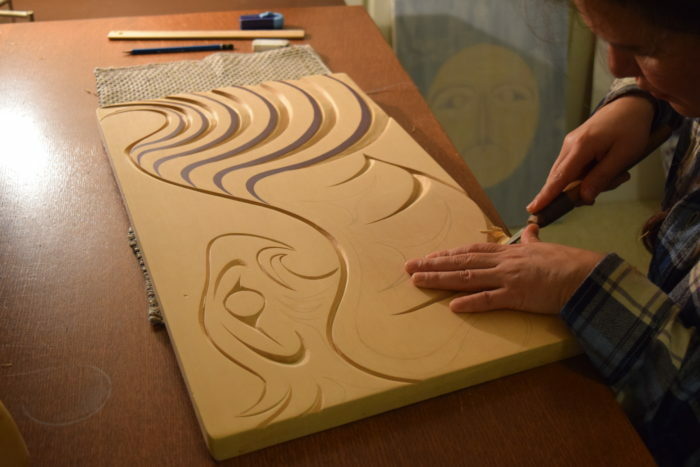 Sparrow describes her work as “feminine Coast Salish” — she spent time cultivating her style after learning carving from her dad who, she said, worked in more bulky and traditional styles. “If you look at my work and it’s very simple, it has a flow, it’s feminine,” she said. Sparrow is a third-generation Coast Salish artist who works in different mediums. She is mostly a carver and painter, but also dabbles in jewelry-making, weaving and fashion. Sparrow — whose mother is Cree, Shuswap and Tsilhqot’in — is also studying expressive art therapy. “I will be an art therapist as well as being an artist,” she said. As she finishes her first year of school, Sparrow is also planning more events at the temporary Second Beach studio, which is currently open to the public Monday evenings between 5:30 p.m. to 9:30 p.m.
“There will be some workshops that I’ll be putting together for the new year, a couple of feasts,” she said. She has a Facebook group that she regularly updates called Coast Salish Artist Chrystal Sparrow Art Residency. Vancouver Park Board Chairman Stuart Mackinnon said he hopes the city’s cultural residency will expand as the city seeks to have more Musqueam, Squamish and Tsleil-Waututh artists-in-residence at the Second Beach space. The park has a challenging history as it was never ceded by the Coast Salish people who once lived there. “We are honored to have an artist of Chrystal Sparrow’s ability and lineage to inaugurate our A Frame activation at Second Beach,” he said in a statement.